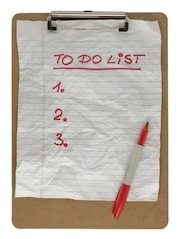 People like “to do” lists and frankly, they are pretty darn effective. You have something written out just waiting to be checked off with an emotional satisfying swipe of the pen. So, without any further delay, here are three things you can do TODAY that can move your note business forward. To Do Item #1 – Write a letter to a potential referral source. Contact a real estate agent, CPA, attorney, title agent, escrow company, or other real estate professional. Tell them what you do and how you would appreciate any referrals they can give you. Just send one letter. Follow up a week later with a phone call. Starting slow enables you to tweak the letter (and the phone call) to get better at it. To Do Item #2 – Go read a couple of articles on NoteInvestor.com. Here you will find hundreds of free articles (just dig deep into the site and read something that sounds interesting). Want more? Check out the free finding cash flow notes videos. To Do Item #3 – Post something on your website. Write something about the note industry. How to sell a note, what the process takes, anything. It doesn’t have to be some in-depth article – just something to get you in the habit of writing. The more you write about the note business, the more you will be able (and comfortable) talking about it. Don’t have a website? Check out the article How To Build a Note Business Website in 7 Steps that also includes some sample sites for ideas. Many people forget building a note business is not a daunting task…when you take it one step at a time. …contacted 36 professionals that can potentially refer you business. …published 36 short articles on the note business. This will either help your site rankings or be the basis of a free eBook you can give to potential referral sources, sellers, or contacts. …read over 72 articles on NoteInvestor.com – you will be well on your way to becoming a mortgage buying expert! Not bad for 90 days! But it starts small, so start TODAY! Thank you for a very informative article. Great advice for newbies and seasoned note buyers. Thanks for this post I never thought about doing this its going to be routine for me from now on.